As free agency rolls around and we prepare to see the dollar bills flow, we want to do our best here at PFF to try and curb reckless spending. Buyer’s remorse is a phenomenon we all experience, but our discomfort over buying the wrong brand of toilet paper pales in comparison to owners and general managers eating millions of dollars to cut a guy one or two years down the road (although maybe not depending on how cheap you went). With that in mind, let’s take a look at the guys whose price tag we likely wouldn’t want to match in free agency. 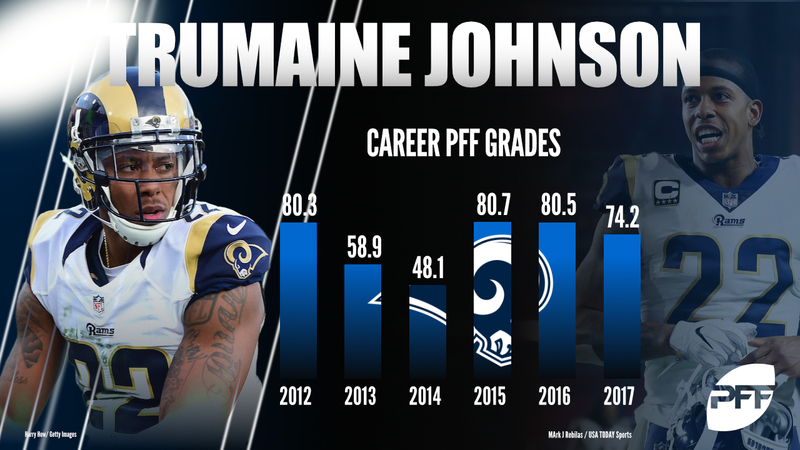 Johnson has all the traits of an elite corner, and the fact that he was franchised twice already might suggest he is one, but nothing in our grading agrees with that evaluation. In fact, it can be argued that Johnson was the weak link in the Rams’ secondary at times last year. He gave up at least 79 yards in four separate games and his 759 yards allowed were fifth-most among all corners. He’s a solid starter, but is not worth near what he got paid the past two seasons. Brock Osweiler, Mike Glennon, A.J. McCarron. Rinse. Repeat. There is nothing in McCarron’s 201 career dropbacks that suggests he’s ready to be a franchise quarterback. At the same time though, he wasn’t dreadful and hasn’t seen the field for a meaningful stretch of time in three years so he has to be better now, right? Right? The allure of potential at quarterback gets GMs all hot and bothered, but he was a fifth-rounder for a reason and has done nothing to change our minds on that. Kyle Shanahan’s system is built to make running backs look good. Running behind PFF’s sixth-ranked run-blocking, Hyde only managed a measly 3.9 yards per carry this past season. Sure, he’s flashed impressive games or stretches over the course of his career, but you better be a consistently dominant runner to make up for how bad Hyde is in the passing game. Last season he allowed more pressures (13) and dropped more balls (nine) than any other running back. 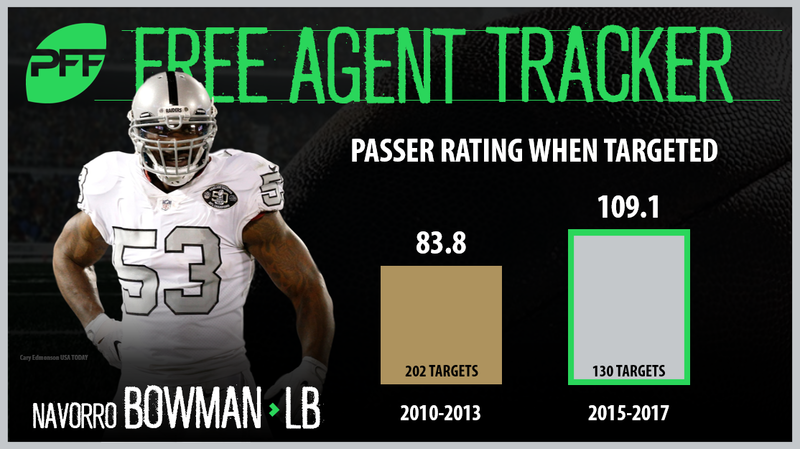 A thin defensive tackle market sees Poe as likely the second-best option available after Sheldon Richardson. He’s a fine player, but far from a difference-maker. After taking a one-year, $8 million ‘prove-it’ deal with Atlanta last year, he did just that. What he proved by earning the 35th-highest grade among defensive interior players is that he’s worth around $8 million a year and not the eight-figure per year deal he’s likely to get. Vaccaro is another player who has never been right since suffering a serious knee injury. The former first-rounder was a serious rookie of the year candidate before breaking his ankle in Week 15. His struggles came to a head this past season, where he allowed a career high 492 receiving yards after being moved more into the slot. Vaccaro once again ended his season on injured reserve, this time with a torn groin. Multiple serious injuries have all but zapped the soon to be 30-year-old linebackers change of direction ability. He went from one of the league’s best all-around linebackers to now someone you’d rather have watching from the sidelines on third downs. He has five total pass breakups and interceptions over the past three seasons after averaging seven per year in the three seasons prior to injury. This one is a matter of price tag. We’d be fine with Nate Solder starting at left tackle for us next season, but the fact of the matter is that every team with a poor left tackle feels the exact same way and there’s no other option in free agency. Solder is going to get top-dollar despite ever being close to a top tackle. The highest he’s ever graded out among all tackles as a pass blocker was 21st back in 2013 and he was 45th this past season. As mentioned before, consistency is extremely important at the running back position and Martin is the antithesis of that. His ability to go absolutely in the tank for long stretches at a time is second to none. Martin has two seasons (2012 and 2015) with 50-plus broken tackles as a runner. In all other seasons combined (543 carries) he has just 46. This past year, he broke all of six tackles on 138 attempts. Don’t let Ford’s first-round pedigree and 11 sacks in 2016 fool you, this isn’t the edge-rushing option you want in free agency. Even in his best season, Ford was extremely inconsistent and an all-or-nothing type of pass-rusher. His 7.4 pass-rushing productivity this past season was 85th out of 113 qualifying edge defenders.